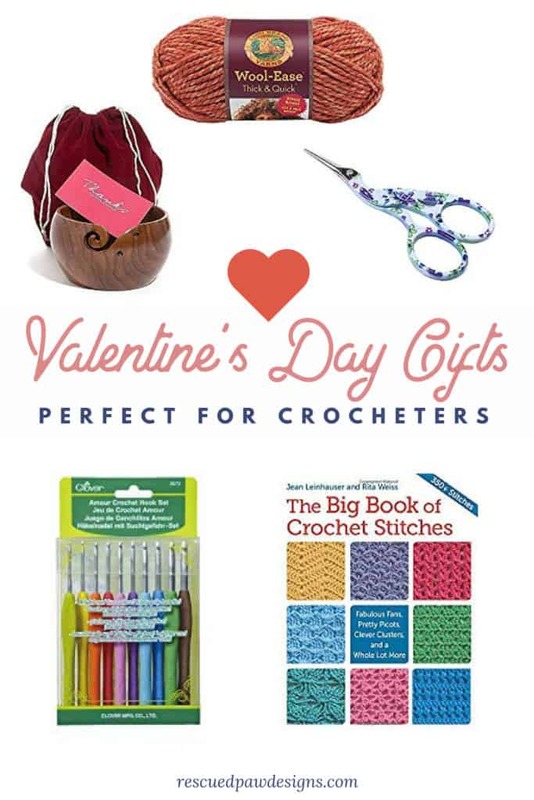 If you are a fellow crochet lover who wants to give a little hint to their loved ones on Valentine’s Day then you gotta read this post! I found five different gifts for crocheters that will make their (or yours!) Valentine’s Day even better! Read on down to find the full gift list! My husband and I don’t usually celebrate Valentine’s Day but this year may be different because this list is getting sent to him! If it has to do with crochet or yarn I’m all in. Let me know which Crochet Valentine’s Day Gift you pick! I bought this set last year for myself and these are some of my FAVORITE crochet hooks! I am certain these will make a great Valentine’s Day gift! This a great book for beginner and experienced crocheters alike. I used it when I was first starting out and sometimes I still use it today for more advanced stitches. This one comes in a kindle or paperback form for your Valentine! While I don’t have this exact yarn bowl I do have one that I use ALL the time! It come in handy when you are trying to crochet on the couch (or really anywhere) and the yarn keeps rolling around. If you get this one for Valentine’s Day you can’t go wrong. I am going to take a wild guess and say that YARN is the number 1 wanted Valentine’s Day gift. Did I guess right? There really isnt’t a way you can go wrong with this gift! Scissors and crocheting go hand in hand. You will need a great little pair of scissors to cut off those pesky ends and for a clean cut. These cute flower ones above are perfect to get for your Valentine! Which Crochet Gift are you asking for? I mentioned before that I am going to ask for those fancy but super cute scissors above! Which one is your favorite? Want more fun posts?